For a "paperless" society, I sure do get an awful lot of paper waste: flyers, junk mail, weekly circulars, and local "news" papers... not to to mention my kids' homework. Despite our best intentions, it isn't going away anytime soon, and if you don't have curbside recycling, it's a pain and a mess to deal with. So what do we do with it? So in this week's rendition of Forgetful Frugal Friday, I'll show you a handy gadget that will help repurpose all that junk mail into many different uses. 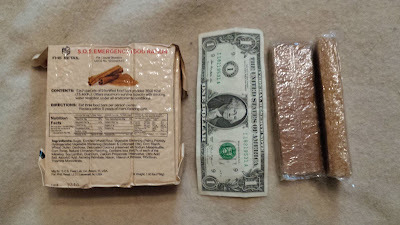 While doing my reviews/testing on the five different brands of emergency rations, I noticed that most of them were “USCG approved”. This lead me to research what the requirements are for this approval, and that led me down a rabbit hole of specifications for life boats and the gear that they are supposed to have in them. The United States Coast Guard doesn't actually test items; they just set out the requirements and let independent labs do the testing. After various disasters at sea, the US Coast Guard developed rules and regulations for the maritime industries. These regulations have changed over the years, and they are codified in 46 CFR 199.175 - Survival Craft and Rescue Boat Equipment. For those of you who are not conversant with government regulations, that gibberish translates as “Code of Federal Regulations number 46, Part 199, Subsection 175”. I've dealt with various regulations most of my adult life, so navigating through them is second nature to me, but I know they can be daunting at first glance. They are also a sure cure for insomnia. Working a merchant vessel is an option for some folks, and it has been used as a plot device in books and movies as an alternative to buying a ticket on a passenger ship, which is something to consider if you're looking for optional ways to get back home. Knowing what you can expect to find in a lifeboat might set your mind at ease about traveling over water, and it may also give you a starting point if you're building you own “lifeboat” for emergencies. Most of the items on the list below are generally useful in any emergency, and would make a good addition to a bugout vehicle. When you think about it, a life boat is the bugout vehicle of the seas. Here's a list of what you should find in a standard lifeboat, with the USCG requirements listed first and the International Maritime Organization requirements for Safety of Life at Sea (SOLAS) in parenthesis. I won't describe the specific requirements (caution: deep rabbit hole), but will elaborate some of the terms that may not be familiar. Bailer 1 (1) – a cup on a string for dipping water out to the bottom of the boat. Bilge pump 1 (0) – a pump connected to the lowest part of the boat (the bilge), used to pump out any water that may have gotten in the boat. Boat-hook 2 (0) – a long stick with a hook on the end of it, used to manually push or pull a boat around other things. Can opener 3 (3) – a lot of the supplies will be packed in steel cans to protect them. Fire extinguisher 1 (0) – specifically a type B-C (dry chemical) extinguisher. First Aid kit 1 (1) – they specify a very simple kit. Flashlight 1 (1) – with spare batteries and bulbs. Hatchet 2 (0) – one on each end of the boat, attached with a lanyard. Heaving line 2 (1) – a piece of rope with a floating weight on the end, used by throwing one end of the line (heaving) to a person in the water or another boat. Oars 1 (0) – oars lock into the sides of a boat. Paddles 0 (2) – paddles are held in the hand. Painter (free floating link) 2 (1) – a tow line attached to the front (bow) of a small boat. Provisions/rations per person 1 (1) – roughly 2400 Calories per person. Sea anchor 1 (2) – a small parachute that drags in the water, slowing the drift of a boat. Skates and fenders 1 (0) – plastic or wooden “bumpers” that help reduce damage while launching or recovering a small boat. All of the small items have to be stored (stowed, in naval-speak) in the lifeboat in such a manner as to prevent loss or damage, which mean that they should stay with the boat even if it capsizes. Containers and racks for this equipment must be marked with international symbols designating the contents. Lifeboats have to be inspected and overhauled every year, with perishable goods replaced as they reach their expiration dates. While most people choose to cross oceans by airplane these days, there are still passenger ships working some of the less-travelled routes. Having looked at the supplies available in a standard lifeboat, I'd have to say that the Robinson Crusoe of today would have a pretty good head start on staying alive until he was found. I like the fact the rice can be microwaved in the pouch or taken out and added to other things. As an added benefit, there are other rice and flavor choices available. I've been out of rice for a week and just got back from the store with 5 bags. One is going into my GHB right now. If some of the other flavors contained a bit less sodium, I will buy extras to rotate into my bag. If I ever need to use my Get Home Bag as intended, I want to be drinking my water because I'm thirsty and not from all the added salt in my food. Another addition to my GHB, and especially to my lunch box, is a neat little item from Sam's Club. Grown in the sun and harvested at peak flavor, Pacific's favorite red peppers are slow roasted to bring out their natural sweetness. Vine-ripened tomatoes, organic milk, and a warm blend of spices round out the flavor for a soup that tastes like summer but can be enjoyed any time of the year. I didn't buy this for the trendy organic contents; I bought it because I like tomato soup and the fact it is a perfect addition to my lunch box. 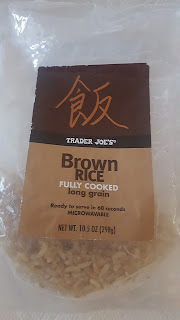 At 8 oz., I can microwave this in my coffee cup instead of needing to pack a microwave safe bowl when I bring something else like a sandwich or leftovers. The box has a spout very much like a quart juice carton or water bottle, with the safety seal breaking when you unscrew the top. Since it is a rectangular shape, the box stacks nicely in the corner of my lunchbox and on my pantry shelves. The flavor is very good, with a better taste than the 'just tomato soup' brands. I may buy an additional case soon and throw a couple into each of my Buckets of Holding. There is always someone around who knows more than I do. Asking for help and information is not weakness, but knowing what you don't know. Five packets of Uncle Ben's Ready Rice from Walmart: $1.84 ea. in the store, $2.00 if ordered and shipped to the store. 12 eight oz cartons of Pacific Roasted Red Pepper & Tomato Soup: $10.98 from Sam's Club. Cast iron is incredibly durable and can last virtually forever. As I mentioned last week, cast cookware can often be found very cheaply at yard sales and thrift stores, but the downside of these low prices is that the cookware is often in pretty rough shape. Thankfully, cast iron is also easy to rescue from a life of rough treatment. When buying used cast iron, inspect it for major damage. Rust and minor pitting are easily fixed and not a major concern. Major pits, as well as any cracks or breaks, make a pot a no-go. Lids should fit snugly and also be in decent shape. One you've determined that your pot is physically sound, you can get down to repairing damage. First, you need to remove any loose rust or debris, and a wire brush is great for this. Large areas needing rust removal might call for a wire wheel or cup brush mounted in an angle grinder, or a brush mounted in a power drill. If you do use power tools, be sure to wear appropriate gloves and eye protection! Use light to moderate pressure on the tool to clean the heavy rust areas. Once the worst rust is removed, lighter abrasives are used to remove the remaining rust. I'm a fan of non-metallic scouring pads for this, but another great alternative is coarse salt, like kosher or brining salt; two tablespoons in a dry dutch oven make a wonderful scrubbing medium. If you do use salt, be sure to rinse and dry your pot thoroughly afterward to prevent further rust intrusion. At this point you have a clean, raw, unseasoned piece of cookware. In order to protect and make it useful, you need to season it. Luckily, this is a pretty simple process, and can be done in your kitchen oven. Preheat your oven to 325° with one rack set in the center position and one in the bottom position. Apply a thin coat of oil to the cast iron, inside and out, just as you would after a regular cleaning. Place the pot upside down on the center rack, and a baking sheet on the lower rack to catch any oil drips. Open the oven door and allow the pot or pan to cool naturally. Once your cast iron is cool, it is ready to cook in or store properly. In the future, simply clean and maintain it normally, and it will serve you well for a lifetime and more. I went to an auction last weekend. I think I've mentioned auctions here before; they're usually a way to buy things at a bargain price and I find them entertaining. This particular auction was for a gun collection that an elderly gentleman had spent 60+ years accumulating, so I went looking for a few items that are absent from my own personal arsenal. During the auction, I struck up a conversation with a group of bidders sitting next to me and had to fill them in on a few of the details on several of the rimfire firearms, which brought up the ubiquitous .22 rifle. 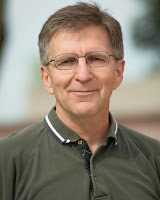 Every prepper website worth its salt will tell you that having a .22 set aside for hunting, pest control, and instructing new shooters is a must. Generally they mean firearm chambered in .22 Long Rifle (22LR), which is the most commonly made rimfire round, and rifles and pistols have been chambered for it for well over a hundred years. What a lot of folks don't know is that there are several other .22 rimfire cartridges, and some of them are compatible with the 22LR while others are not. Here's a brief break down of the ones you're likely to run across. This is the original .22 rimfire cartridge, designed as a pistol cartridge in 1857. It was used in Olympic shooting competitions up until 2005, when strict gun control laws made it almost impossible for many teams around the world to practice. Many companies still produce 22S ammo, but supply and demand place the price at the same level as 22LR which has better performance. 22S can be used in most firearms chambered for 22L or 22LR. 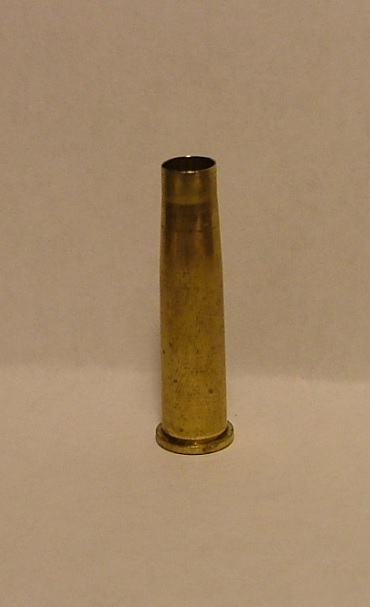 Not a common round, but one that is still available, the 22L is an in-between cartridge designed to improve the 22S by stretching the case and using the same bullet. It can be used in most firearms chambered for 22LR. Using the same brass as the 22L but with a longer bullet, the 22LR is the most produced cartridge in the world. A pain to reload, the brass is normally discarded after use. Found everywhere up until 2013, the 22LR is available in a wide range of bullet weights, bullet designs, and bullet velocities, meaning that you can make the most use of the rifle or pistol chambered for it. Manufacturers are only now starting to catch up with demand (and the hoarders have run out of room to store any more cases of it), so it is starting to appear on store shelves and at a more reasonable price. Introduced in 1959, the 22WMR uses a larger diameter case and bullet than the other common .22 rimfires. It is possible to chamber a 22LR in a 22WMR gun, but this is discouraged in the strongest language possible because the brass won't seal the chamber properly and it could lead to damage to the gun or user. Since 22WMR is a newer round by almost 100 years, there are fewer guns chambered for it, and it costs about twice what 22LR goes for. Its extra case capacity and heavier bullets make it a better hunting round on game larger than rabbits and squirrels at ranges out to about 150 yards. 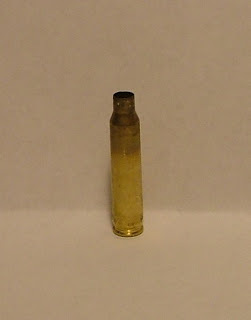 Using either a plastic cup or a crimped case to hold a few pellets of #11 or #12 shot, the 22 Shot-shell is designed to kill rats and small birds at close range without punching holes in your dwelling. They are fun to shoot, but expensive, and may not cycle a semi-auto action. Additionally, the crimped-case style doesn't like to eject from slot-type ejection ports because the cartridges remain longer than a spent 22LR case. This one is still out there, hard to find and causing confusion when it is. Only a relatively few rifles were ever chambered for these cartridges, making them attractive to collectors. The .22WR is basically a shortened version of the .22WMR and can be chambered is firearms made for 22WMR. The development of better powders for the .22LR in the 1930's erased any advantage the .22WR had and it is no longer an option on new guns. CCI and Winchester occasionally make a production run of this ammunition, and then idle the equipment until it is sold out. This leads to a sudden price drop as a new run hits the market, followed by a steady climb as the supply is depleted. This ammunition is rare and generally only found at specialty shops. This is basically a percussion cap from a black-powder pistol with no powder (the priming compound was enough) and a BB or Conical Ball (CB) pressed into the mouth for a projectile. 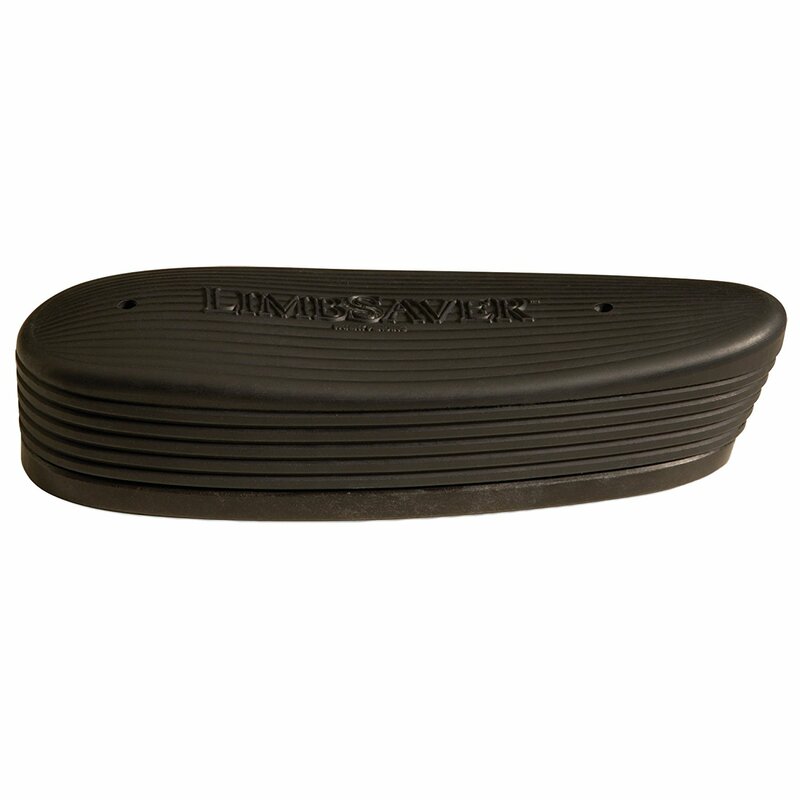 These were designed for use in very small shooting ranges or galleries at fairs and exhibitions. Shooting galleries used to be a common sight inside cities a hundred years ago, and having a target range in your basement wasn't unheard of either. Cheap, quiet, and effective at honing or teaching the basics of marksmanship, the 22CB has been replaced by several primer-only 22LR cartridges in recent years. An attempt at making the .22 Long more effective in rifles, these were supplanted by the 22LR, which borrowed the bullet from the .22 Extra Long and became a much better cartridge. 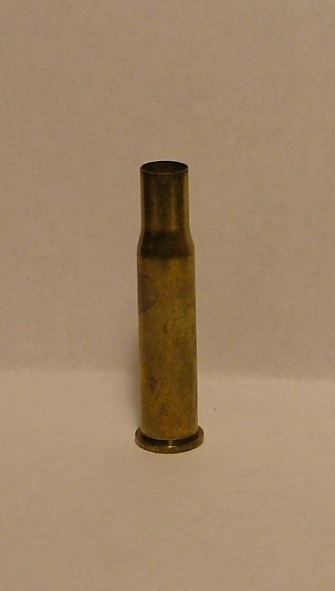 This round has the same overall length as the 22LR, but with a slightly longer case and shorter bullet. It is notable mainly for being the base cartridge for the 17 Mach 2, a rare chambering in itself. 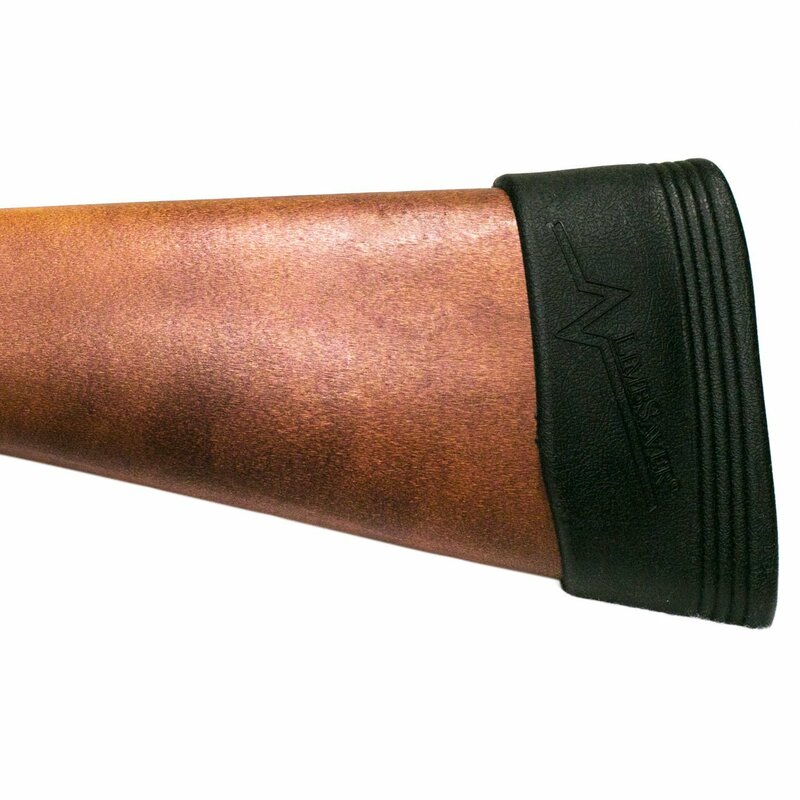 If you're looking to buy a .22 rifle, look at the side of the barrel. Normally there will be information stamped on the barrel somewhere near the chamber indicating what cartridge the rifle is designed to fire. Semi-autos like the common Ruger 10-22 will only shoot 22LR, and sometimes they get picky about working with standard velocity ammunition. Bolt action, lever action, pump action, and single shot rifles will often be marked “22 S, L, or LR” and will feed, fire, and eject all three types. This leads to more options if you're scrounging for ammo, or if you want options like subsonic or high velocity rounds from the same rifle. Newer rifles may not have the proper internal pieces to manipulate the 22S and 22L cartridges, so keep an eye out for good used guns. Pistols are similar to rifles in that the semi-autos get picky about wanting a specific load (usually high velocity) and will only work with 22LR. Revolvers and single shots will eat just about anything, but the point of impact will vary as the velocity and bullet weight change. 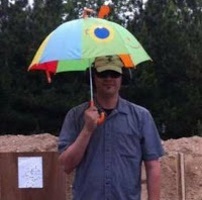 Kentucky windage is a skill that takes some practice but comes in handy. If you're looking for any ammunition, check our sponsor Lucky Gunner. 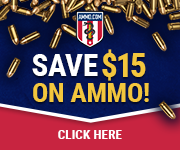 If they don't have it, I often use www.ammoseek.com to check prices and availability for my ammunition purchases. For odd and obsolete ammo, Old West Scrounger has been a resource for many years. For detailed information on cartridge dimensions, SAAMI is the only source to use. The Sporting Arms and Ammunition Manufactures Institute sets the standards for all ammunition produced in the USA. Most reloading manuals will have basic information on center-fire cartridges, and they get their information from SAAMI. I've made some additions and subtractions to my gear. These are mostly good, but one will change how I plan my Get Home Bag supplies. I work in the middle of the Fog Belt three days a week, where 25mph winds can make you think it's February instead of June. Fog blows in most mornings and does burn off many days, if we are lucky. 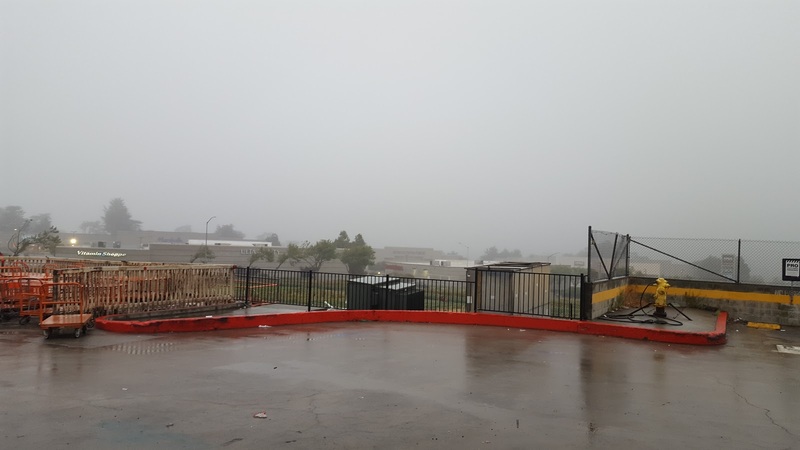 Actually, this is a little wetter than most mornings, but not by much. This picture is not a normal Summer (June or July) day for San Francisco... at least, not normal until August and running through mid-October. 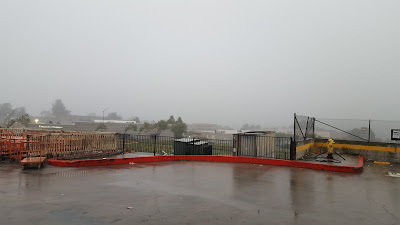 After the Central Valley heats up, the winds blow all the fog out to sea, leaving perfect weather to roam around The City without seeing shivering tourists. I posted this to show exactly why a poncho, lightweight wool socks, and a long-sleeved t-shirt are in my bag pretty much all year long. I do take out a heavy shirt to make room for more water in the summer, but that is about the limit to my equipment changes. Where I live can be almost 100°, and yet San Francisco could still be 70°. In the winter it can be 65° and 45° with rain. Having to plan for a 30° temperature swing in 45 miles could easily double the size and weight of my bag if I let myself over-pack. 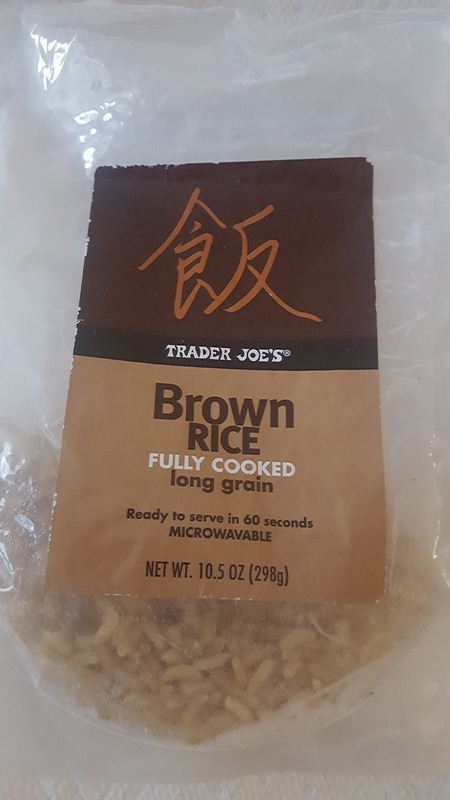 A change that is definitely not for the better is in the food I pack in my GHB and my pantry: The Trader Joe's Cooked Brown Rice I like is now discontinued. This rice made a very convenient addition to my bag and even my lunch box. Since it was sealed in extremely heavy plastic, chances of the bag being punctured if things bounced around in my car were slim. When I thought it had been in my trunk too long, I'd take a package out and swap in a fresh one. Instead of using the rice cooker for a small batch, some days it was easier to dump half a package in the bottom of a bowl and add whatever was left over from the previous night's dinner to my lunch. Now I have to think of another simple addition to the food in my bag that will be as light and filling as this, which is not going to be easy. A good change to my gear is another knife added to my collection courtesy of my friend, the Master Chief. He decided that, "By God, if it was good enough for for the Marines and Navy for 70 years, it's good enough for you, you inbred, degenerate sorry excuse!" 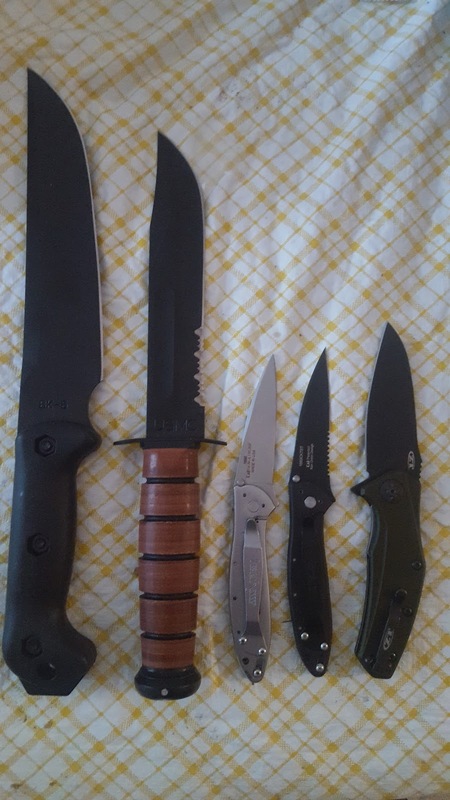 So I now have a Marine Ka-Bar to go with my other knives. 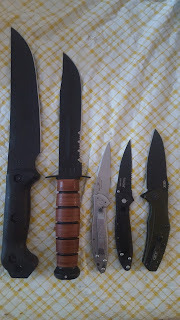 From Left to Right: Ka-Bar BK-5; Ka-Bar USMC; stainless Leek; black Leek; and a ZT 0770ODBLK. Out of the box, the two Ka-Bar knives may not be as sharp as the three Kershaw's, but they are sharp enough to do the jobs I intend for them to handle. I'm not sure how many sharp instruments I have within easy reach, and that's not counting several knives still in storage boxes and all my multi-tools! 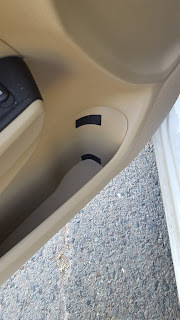 One final thing: last week I mentioned adding Velcro to the door pocket of my car to hold a flashlight and not having a good picture of that, but I changed flashlights this week and now I have a clean shot. 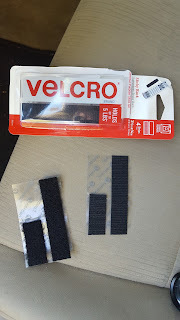 The next addition to be Velcroed down will be a glass breaker and belt cutter emergency tool, if I can find a small version of the one I had in my truck. Craft your plan for your specific situation. Heat and cold in the same day may seem odd, but that's my normal. Always have a Plan B, C, D, or as many as required for you. Food can be discontinued, so plan for a replacement(s). One Ka-Bar serrated USMC knife: $69.97 from Amazon with Prime. One Ka-Bar BK5: $52.00 from Amazon with Prime. One Kershaw Stainless Leek: $40.99 (!!!) from Amazon with Prime. This is less than what I paid for my knife from Walmart 15 years ago! One Kershaw Black, serrated Leek: $38.00 from Amazon with Prime. One Zero Tolerance 0770ODBLK: $160.00 from Amazon with Prime. Cast iron is possibly the best cookware made. Cast pots and pans heat evenly and hold heat well, can be obtained fairly inexpensively, and with proper care they will last for generations. My father has Dutch ovens that he has been cooking with for nearly 40 years, and they cook better now than they ever have. A large part of the reason for that is due to how they're cleaned and seasoned. "Seasoning" cast iron refers to treating it in such a way that it develops a hard, durable, nonstick coating. Newer cast cookware has a seasoning applied at the factory, but it's not ideal. You can remove it and replace it if you want, but even that isn't really necessary. Simply using your cookware and cleaning it properly will impart the kind of coating you want to have. The test subject for this lesson is a frying pan that I have had in storage for a few years. It was clean when I put it away, but it's accumulated some dust and crud and it could use a good cleaning. 1) Remove any loose food bits or other crud from your pan. Commercial plastic scrapers are available at outdoors stores and some kitchen gadget stores for this, but wood or plastic spatulas also work very well. Don't use metal spatulas! They can cause damage to the coating on your pan and make a lot more work for you later. 2) Add some hot water to your pan. Alternately, if your pan is cool, you can simply heat water in it. 3) Remove any remaining food bits. Do this with a non-metallic scouring pad and gentle pressure. Note that I haven't said a word about detergent. That's because we're not using any. Oil is what makes the seasoning work, and detergents eat oil. In almost 40 years, we've never had a problem with hygiene; the pan gets hot enough to kill anything in it, and nothing is left behind when we're done cleaning. 4) Drain and dry your pan completely. If it is hot enough, drying is almost instant. When it cools enough not to burn you, use a paper towel to remove any remaining water. 5) Cover the entire pan in oil, inside and out. Put a small amount of oil in the bottom of your pan, and use a paper towel or basting mop to every every surface - including the handle and lid, if applicable. I use common vegetable oil, mostly because it's cheap. Canola and flaxseed oils are also popular, if you happen to have them around. 6) Wipe away any excess with a paper towel. This will leave your pan with the black sheen cast iron is known for. 7) Store in a cool, dry area until you're ready to use it again. Next week, we'll look at how to save problem pots. This post is brought to you by a friend having bought an old German single-shot rifle chambered for 8.15x46R: 8.15 millimeter bore and a 46 mm long, rimmed, case. No, I'd never heard of it either. So now my friend has this lovely old boomstick with no ammo to be found for it. The saving grace of this is that it's a cartridge that can be made by taking a cartridge case that's close enough, and using the sizing die from a loading set to form it to the right shape,,, or at least close enough (which I'll explain later). First, I'm going to use a much more simple example. 1) Take a .223 case and trim it. 3) Run it into the sizing die. 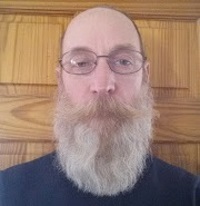 4) Trim to final length. 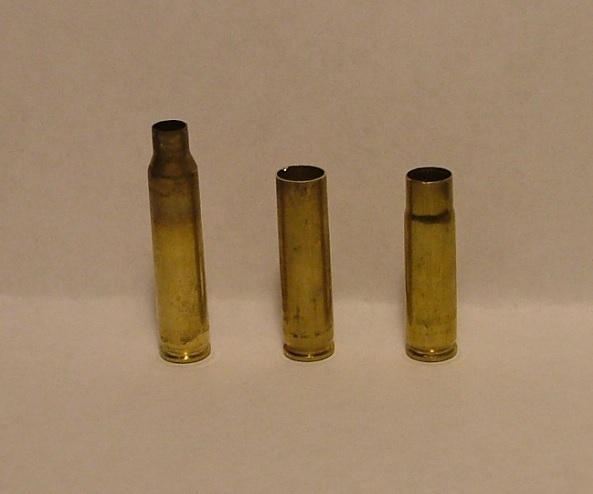 L-R: .223/5.56 cartridge, trimmed cartridge, resized .300 Blackout cartridge. For a lot of cartridges, this (sometimes with a little variation) is all it takes... but then you get to something like that oddball 8.15mm. 1) Cut it to approximate length (a little too long is better than short). 2) Remove any burrs from the new case mouth. 3) Lube the case, both the entire outside and the inside of the case neck. 4) Run it into the sizing/depriming die. That's the easy part, and often the only part. Some cases will need to be trimmed to final length (if they're a bit long) and deburred. After that, they're ready to load. Then, the first time you fire it, the heat and pressure will fire-form the brass to the chamber, and -- since it's a single-shot rifle -- you'll probably never need to resize it again. But not here, oh no. Because there was a lot of variation in these rifles, sometimes it needs more steps. 5) The rim of the case was a little too large in diameter, so it needed to be cut down a bit. In this case. I took a coarse file and, holding it steady, dragged the rim down it while rotating the case to take off a few thousandths. 6) Try it until it's right. In this case, it reduced the diameter from the standard .506" to .486". 7) At this point we discovered that the rim was a bit too thick for his rifle. To thin it, we used a piece of 220-grit wet-dry sandpaper on a thick piece of glass. Use plenty of water on the paper, work the base in a figure 8 pattern, then turn it in your grip a bit and repeat. (Yes, it's a slow process.) The original thickness was .063"; now it's .040" and the action closes on it snugly. Yes, it's a lot of work for just one cartridge. We're going to find a small lathe to use, which should make trimming the diameter and thickness of the rim a lot faster. He'll never have a lot of cases, but they should last a long time. That's the basic course in forming brass for a new use. In some cases, the actual forming is far more involved since the difference between the original case and the thing you're after is drastic enough that the forming has to be done in steps. For some old black-powder cartridges, there are companies that make, say, a '.45-caliber basic' case; it's long enough and large enough in diameter that with the correct dies you can form it to a number of different cases. And with most of these being for single-shot rifles, take care of these cartridges and they'll last many firings, so it can indeed be worth it. A little freaky hat Forgetful Frugal Friday today. Prepping for a quick emergency doesn't take a lot of cash, nor a lot of time, if you know what to look for. I picked this little gem up (with a couple of extras) around Christmas time from Meijer, a local big box midwest chain, for $19.99 or so. The extras I put in it were also available in the same aisle in the same store. In a few weeks I will simulate a backwoods breakdown and go camping for the weekend using this kit. The SOS brand comes in a few different forms and flavors, so I just decided to roll them all together into one review since they're all made by the same company in Doral, FL. Like the previous brands, I used these to replace a meal or two a day for a couple of days during my hectic spring season at work. I'm either driving or sitting in a field for most of my weekdays during spring, and don't have access to food other than what I can throw in my lunchbox. Chips and sandwiches gets boring, and I don't have time to cook after a 14 hour day at work, so this was an easy test for me. Also like the other tests, I bought these with my own money. The makers and sellers have not given me anything nor are they aware that I am doing this comparison. All photos are my own work. I found two different forms of SOS bars, the individually wrapped “New Millennium” bars (on the top) and the more traditional 3600 Calorie packages (on the bottom). All of the bars are the same size, which leads me to believe that they all come out of the same machines. Being about 5 inches long, 1.5 inches wide and 0.5 inches thick, they are easy to eat. The bars are all made with the same base ingredients; sugar, flour, palm/soy/cottonseed oil shortenings, corn starch, coconut, flavoring and various preservatives and vitamins. They contain wheat, coconut, and soy for those of us with food sensitivities. Like most other brands, each bar is a "meal" and 3 bars will get you through a day. The 3600 Calorie packs consist of 9 individually wrapped, 400 Calorie bars inside a heavy plastic/Mylar, vacuum-sealed pouch. There's no breaking off pieces to get a “meal” this way, and they're easy to dole out to others. The 3600 Calorie packs are designed for a 72-hour kit and cost $8.44 on Amazon. That breaks down to $2.81 per day or $0.94 per “meal”. 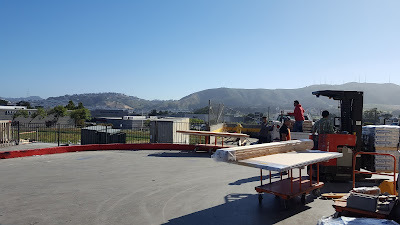 Theses have a US Coast Guard number (either a contract number or an approval number), so they have the minimum 5 year shelf-life and temperature rating. The “New Millennium” bars were a bit more expensive. I got a mixed flavors box of 18 individually wrapped bars (that's 6 days' worth) for $27.90. That makes $4.65 per day, or $1.55 per meal, which is slightly cheaper than a “Cliff Bar” commonly sold in outdoor shops ($1.58 apiece on Amazon). The New Millennium bars come in Lemon, Coconut, Tropical Fruit, Cherry, Vanilla, and Blueberry flavors. Has a slightly oily texture (likely from the palm oil). Not as hard as most of the other bars I've tried. Very easy to bite into. I'm not positive, but I suspect that the flavoring may be sprayed on the base bars after they come out of the oven. The flavors just seemed to be stronger on one side. There was very little variation in the color of the different flavored bars, which tells me that they have a fairly tight QA system in place. The flavors of the New Millennium bars are actually quite good. The cherry flavor was fairly strong and sweet, most of the others were lighter in flavor but still distinct. Coconut is the “default” flavor of the 3600 Calorie packs, but they do have a cinnamon flavored version that I haven't opened yet. I may save that one for my truck bag. The bars were filling enough that I didn't get hungry between my normal meal times. All of the packages that I got had been manufactured within the last 4 months, so there is still plenty of shelf-life left. Packaging was sturdy, and none of the vacuum-sealed packages had been breached in shipping. They have good vacuum pumps as well - it's very easy to see the edges of the bars through the plastic. I like the shape and size of the bars. The fact that they use an inner wrapper to keep them separate inside the larger packs makes it easier to portion the bars out, which can be important if you have children or childish adults who like to complain about what someone else gets. At less than a buck per bar in the larger packages, these would work as snacks on a normal day. They're more filling than a candy bar or doughnut, and cheaper than some of both. They're also probably better for you. 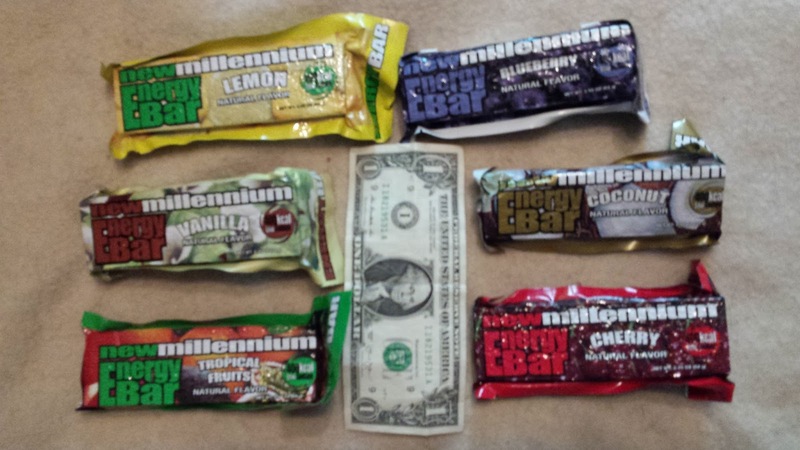 The variety of flavors and individual wrapping of the New Millennium bars makes them worth the extra price to me. Boredom is dangerous, so variety in your food is a good thing. I would like to see them switch to a resealable pouch which would make storing an opened package a lot more convenient. Of the five brands I tested in this batch, and adding the UST Emergency Food Ration bar that I reviewed a while back, this is the best brand so far. Not quite the cheapest, but the variety and quality make up for it. I heartily recommend this brand for inclusion in 72-hour bags or vehicle bags. A follow-up on my knife at the airport story, some changes to my stored items, and a report from a friend on car prepping. While at the airport getting ready to deal with the Travel Nazis, I discovered my pocket knife in my pocket. My knife arrived in yesterday's (Monday's) mail, just a bit over 3 weeks from dropping the package into the airport kiosk. It was in a padded, tear-resistant plastic envelope with my hand written label pasted to it. Other than being the priciest and slowest way to ship my knife to myself, it was exactly as advertised. Good Job, Airport Mailers. I now have my favorite pocket knife where it belongs: in my pocket! A friend who leaves for work when I do (4 AM) recently had a blowout after running over something unseen. He said there was a solid THUMP and 10-15 seconds later, the passenger side front tire went very flat, very fast. Luckily, no one was following him and he was able to get off the road safely and without doing any damage to his car. He followed the steps outlined in this publication on what to do when your car gets a flat. My friend did all this in a textbook fashion, moving safely to the soft shoulder and coming to a stop. This is where he discovered something interesting: Everything in his car not tied down bounced around and came out of wherever it was originally placed. 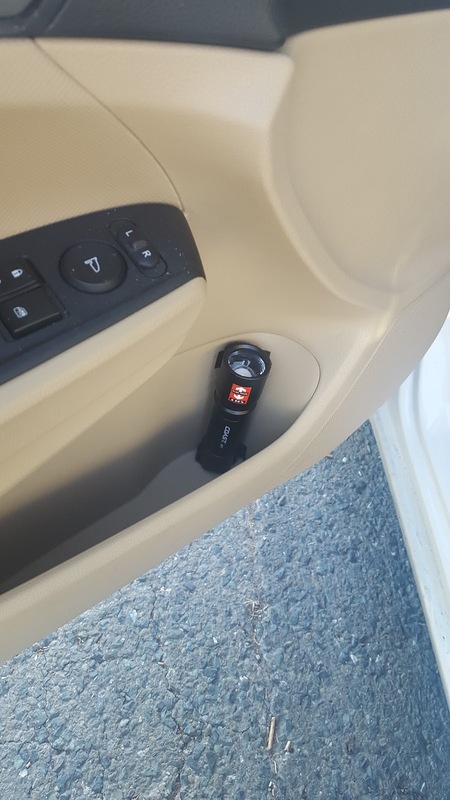 One of the items that came out of the driver's door pocket was his flashlight, which ended up under his feet. 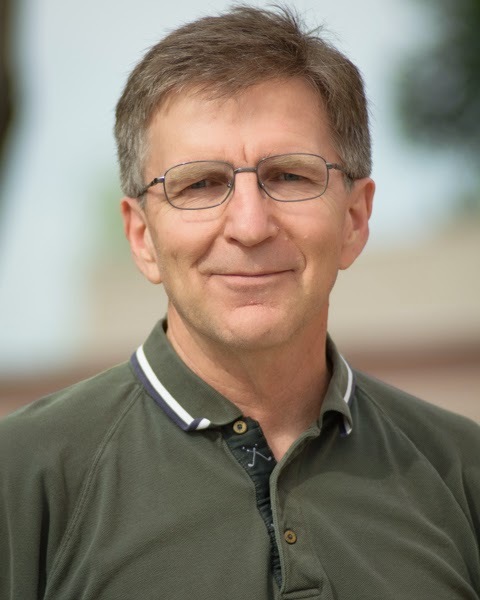 If a bump had been hit at speed, that flashlight might have ended up blocking his brake pedal, which could have made coming to a safe stop difficult. After this incident, my friend thoroughly cleaned his car and figured out a fix for his flashlight that I copied: putting Velcro on the flashlight and also on the door pocket. I can't get a clear picture of the black Velcro on my black flashlight, so you'll have to take my word on this. Sorting out where to mount the Velcro was a matter of how it fit in the pocket and not just on the flashlight. After firmly rubbing down the soft loop side onto my flashlight, I very lightly put the hooks on and pressed the hook-side adhesive onto the pocket. Mounted this way, the top of my flashlight is below the edge of the pocket, so there isn't any way to accidentally snag the light. 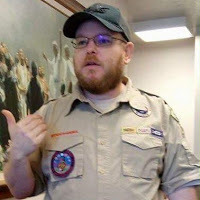 One item was moved into my pantry and fresh stock added to the buckets: A 52-count box of Quaker Oats, purchased from Sam's Club. I like oatmeal as an anytime snack or meal. With the instant type, all I need is hot water and I'm set. All of my stops for work have microwaves, and several have instant hot water taps in their break-rooms. Five Ziploc bags, each holding ten servings, went into storage. Do a thorough check of your gear, especially if you are doing something out of the ordinary. I don't fly regularly any more, so checking for my knife was not normal. It costs to make mistakes! Maintaining a car is more than gas, oil and tires. What is inside the car could cause as many problems as what is neglected under the hood. One package of Velcro: $2.98 from Home Depot; also $2.98 from Amazon with Prime. 52 count Instant Oatmeal: $9.98 from Sam's Club; $14.59 from Amazon with Prime. Lots of people have a shotgun for their home-defense gun, and there's reasons for that: a shotgun loaded with buckshot can deliver the kind of energy you get from a magnum rifle in a short, fairly light package. A shotgun is also fairly versatile. You can load one with light birdshot (often referred to as field loads) and take rabbits and birds; heavier steel shot ammo is legal and effective for waterfowl; and (especially if your scattergun has sights) you can load with slugs that can kill any animal in the Americas (and most anything else for that matter) and easily reach out to a hundred yards or more. All of these things could be important in a real bug-out or long-term situation. The most common shotgun people think of for home defense or hunting is the 12 gauge. 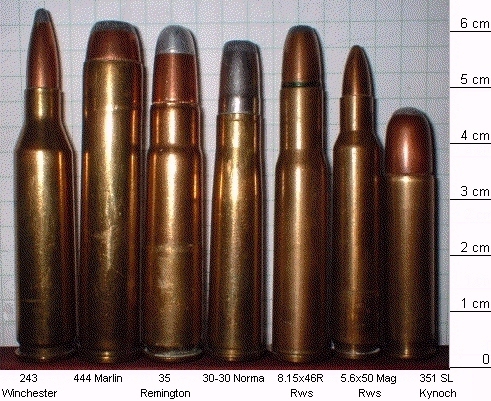 Ammo of various types is available almost anywhere, with shell lengths from 2 3/4" to 3 1/2". Ammunition versatility, as noted above. A 12-gauge shotgun loaded with buckshot or slugs has serious recoil, and that's with standard ammo; the magnum stuff can be brutal. It does not have the same range as a rifle, no matter how well some slugs work. Like a rifle, some loads will pose serious overpenetration hazards for home defense. For most people, the better choice for a home-defense shotgun would be 20 gauge: it's not as powerful, and there aren't as many choices in ammo, but it has less recoil and anyone hit with a 20-gauge load of buckshot won't care that it's not as powerful as a 12. But say you want to go with 12 gauge, perhaps because of versatility and power reasons, or maybe that's all you've got. There are three ways to tame the recoil a bit with buckshot or slugs. Such as something like this.They're made to fit particular stocks, so you need to find the one that matches your gun, remove the original pad, and screw this one on. They also make slip-on pads that will fit almost anything. A good pad makes a real difference. 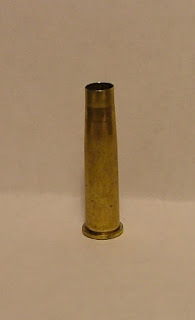 This can be the old method of drilling a deep hole under the buttplate and filling it with lead shot, or it can be a factory-made recoil reducer which are generally some type of sealed metal capsule full of something heavy, like mercury, that has to be mounted in the stock (sound familiar?). There are also stocks specifically made to help absorb recoil (read a review of the Knoxx system here). They're not cheap, and they only fit specific shotguns, but they work. Several companies make low-recoil or reduced-recoil ammunition. These either use fewer buckshot pellets, or use the standard number loaded to a lower velocity. For instance, Winchester Super X 00 buckshot in a 2 3/4" shell uses the standard 9 pellets and has a velocity of 1325 feet per second; the Ranger low recoil in the same size has a velocity of 1145; this makes a real difference in recoil. 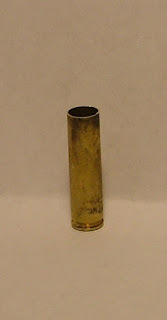 Now compare that to their 3" magnum buckshot, which has 15 pellets and a velocity of 1210; less velocity than the standard, but the weight of six more pellets means a real step up in recoil (see 'brutal', above). Just as with as buckshot, some companies make low- or reduced-recoil slug loads. Picking Winchester again, their 2 3/4" Super X throws a 1 oz. lead slug at 1600 feet per second; the Ranger low recoil uses the same slug at 1200 fps. Newton's laws of motion will not be denied, the energy to push that weight to the higher velocity makes one helluva equal and opposite reaction. There's a lot more we could go into on shotgun ammo, but I think this covers the basics.